For many years the Crystal Lake basin has provided a splendid venue for hiking, from the family-friendly loop trails around the campground, to the trails which take you to the upper rim and peaks. But in September 2002 everything changed. 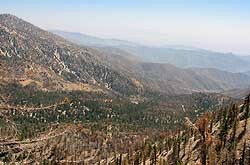 On Labor Day weekend, the Curve Fire erupted and before it was extinguish three weeks later, the fire devastated nearly 21,000 acres, including much of the Crystal Lake basin. The mature forest of stately pine, fir, and cedar was turned into a moonscape with charred sticks. The damage resulting from the Curve Fire led to the closure of Hwy 39 to Crystal Lake for more than 8 years. On March 22, 2011, CalTrans finally reopened the highway and the general public could once again enjoy the Crystal Lake Recreation Area. The scenery is very different from its former splendor, but still offers a rich outdoor experience with blue skies, sweeping views, towering mountainsides, and superb high-country destinations. 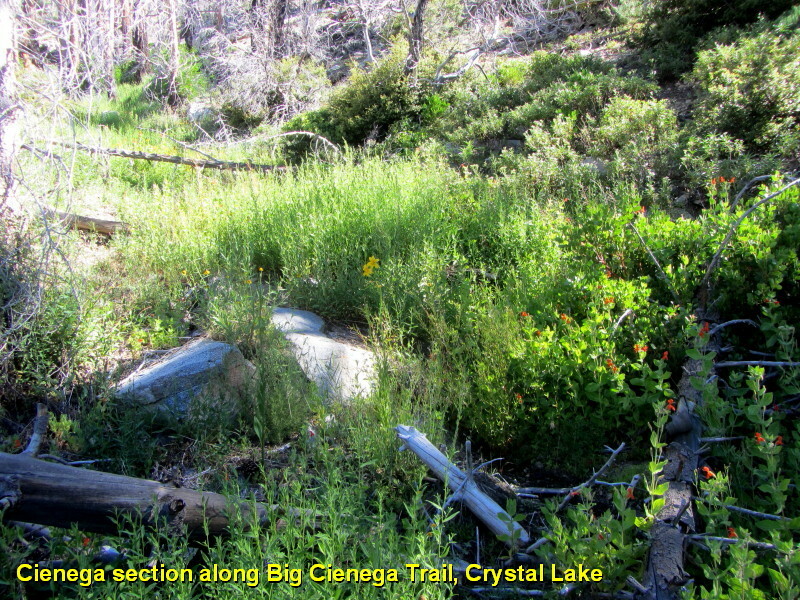 Big Cienega Trail (sometimes misspelled "Big Cienaga Trail") was built by the San Gabriel Mountains Trailbuilders and completed in 1990. It is a fine footpath that provides a valuable connection for the upper-elevation trail network of Crystal Lake basin. It is sometimes referred to as Big Cienega Cut-off. It gains 1,020 feet and travels 1.8 miles from mid Windy Gap Trail on the east wall of the Crystal Lake basin, to mid Islip Ridge Trail, lining the western edge of Crystal Lake basin. Thus it is a route that is used in combination with other trails. See my trail guides for Mount Islip and Windy Gap Trail for complete descriptions of the various options for using Big Cienega Trail. 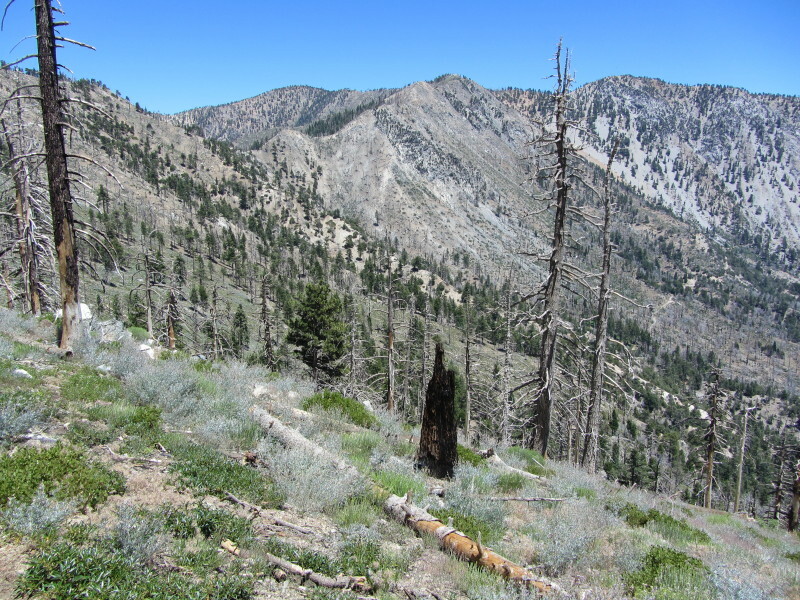 One of the organizations who has been working at restoring the Crystal Lake area is the San Gabriel Mountains Trailbuilders (SGMTB). This wonderful group of volunteers has been building and maintaining hiking trails in the Angeles National Forest since 1984. Much of their activities focus on the Crystal Lake basin. 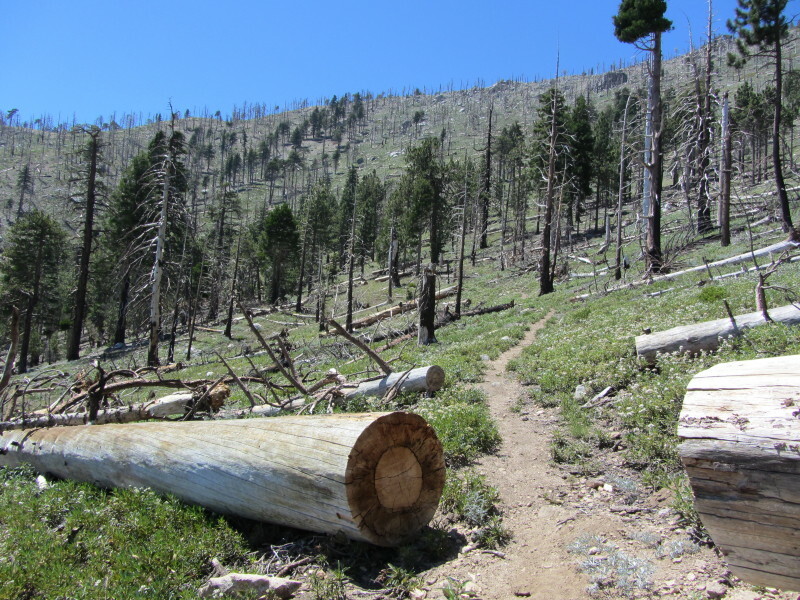 Some of the Trailbuilders' credits include building Islip Ridge Trail, Hawkins Ridge Trail, and Big Cienega Trail. 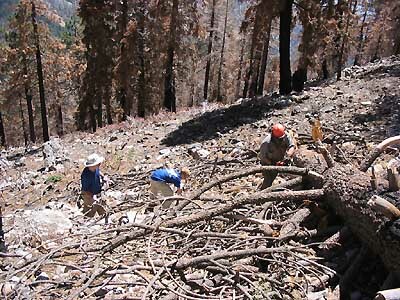 In June 2003, I began working as a volunteer with the SGMTB. 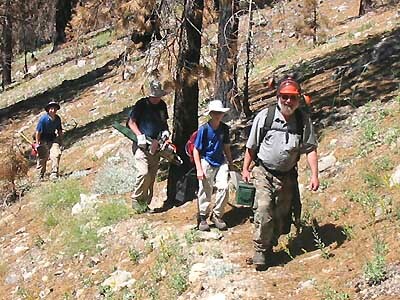 At the time, we were refurbishing Cedar Canyon and Soldier Creek trails. On August 2 we began working on Big Cienega Trail. It starts from the Windy Gap Trail, about a tenth of a mile from where the trail crosses the service road above Deer Flats. Today, as we pressed further up Big Cienega Trail, a team of us forged ahead to remove two trees that had fallen across the trail near Islip Ridge. I explored the ridge to scout out trail conditions. Every time I've gone up to the Crystal Lake area in the last couple months, I've felt some real sadness at the tragic loss of such a beautiful forest. The firefighters did a tremendous job of taking a stand to save the heart of the basin from the raging inferno. But much of the slopes beyond couldn't be spared. The devastation is particularly bad at the lower end of the Big Cienega Trail. Stark, blackened trees rise as toothpicks from the barren, rocky ground, which is void of any organic material. What groundcover the fire didn't consume was washed away by torrents of unrestrained water rushing down the slopes from heavy winter rain. As I graded trail tread and saw a fine footpath emerge, I couldn't help wonder who would even want to hike through this desolate moonscape, regardless of how pristine the path. But today I found myself getting encouraged. There are places along the way where the fire spared some of the majestic cedars, fir, and pine. Oaks are sprouting new growth from the base. 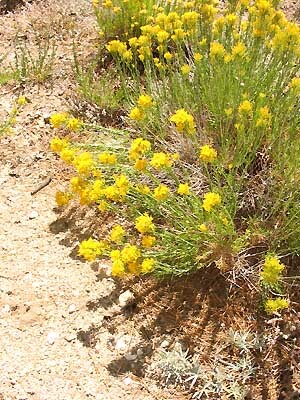 The bright yellow flowers from the rabbit brush graced the landscape. Lupine, fleebane, fuschia, yerba santa, buckwheat  all bring new life to the mountain slopes. On Islip Ridge there are some beautiful stands of mature evergreens and manzanita. 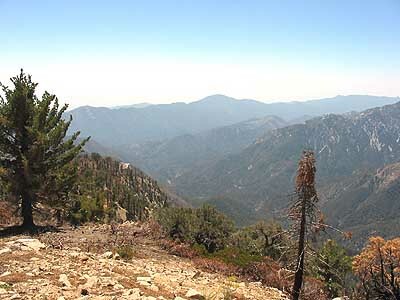 The breathtaking views down into the rugged, pristine Bear Canyon and to the lofty summits of Twin Peaks and Mount Waterman made the 1.9-mile walk well worth it. At about 2:00, the last three of us from the tree-clearing team headed back down the path after a hard day of trail work. Half-way down the trail, our feet begin to tread upon newly cleaned pathway. The crew had made excellent progress for the day. A dozen Boy Scouts and their leaders from Brea Troop 801 had joined us. After a couple more Saturdays, we'll have Big Cienega Trail finished up. I'm confident that when the Forest Service re-opens the Crystal Lake recreation area in June 2004, hikers will once again enjoy its trails. The Curve Fire has forever changed the scenery. But beauty is growing from the ashes. It's a different beauty. It will never be the same. But it is once again beginning to provide a meaningful experience for lovers of the outdoors. It did for me, today. Critters: 8-30-03 - On the way up we saw a deer crossing the road in front of us in the Crystal Lake Campground. Then later, one of our group sighted a family of Nelson bighorn sheep near Islip Ridge. At the end of the day as our caravan of cars was beginning down the road through the upper Crystal Lake Campground, the lead car spotted a full-size black bear crossing the road. We all jumped out of our vehicles and watched the bear strolled into the woods. 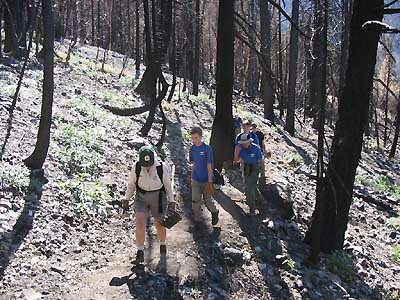 A Long Closure: The Crystal Lake recreation area was closed after the Curve Fire of September 2002. The Forest Service proceeded to repair it from fire and bark beetle damage, and when I first posted this trip report in August 2003, Hwy 39 to the Crystal Lake entrance was open. But the torrential rains of January 2005 badly damaged the road. So CalTrans closed Hwy 39 at the gate just above the West Fork, making the Crystal Lake Recreation Area inaccessible to the public. They made substantial progress, but as of March 2006, the Forest Service said that it probably wouldn't be until late fall 2006 before it is open. The delays continued. Finally on March 22, 2011, after more than 8 years, CalTrans reopened the highway and the general public could once again enjoy the Crystal Lake Recreation Area. 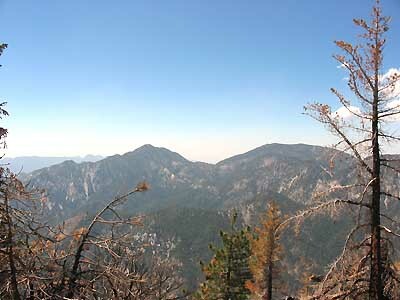 Thankfully during the years of closure, the San Gabriel Mountains Trailbuilders continued to work on the trails so that today hikers can enjoy a splendid trail system. Spelling – Cienega or Cienaga? The correct spelling for this trail is “Cienega” with “eg” rather than “ag” and is spelled correctly in most publications. Writers Jerry Schad and John McKinney spell it correctly, but John Robinson spells it with an "a." The Sierra Club 100 Peaks Section uses both spellings in the same page (obviously an editorial error rather than a compromise). 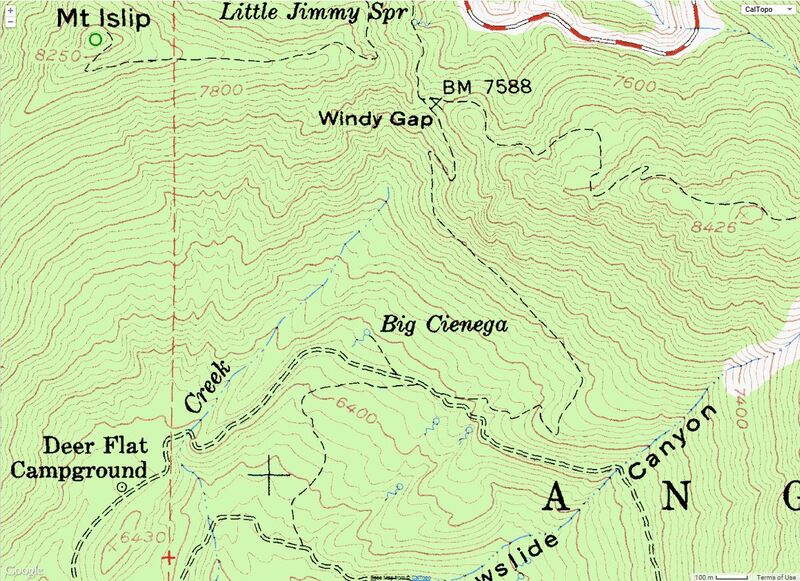 The USGS topo map does not yet include the trail (which was finished in 1990), but the spring for which the trail was named is Big Cienega (with an “e”), as are the trail signs and in the literature of the San Gabriel Mountains Trailbuildersthe group who built the trail. When you do a web search, the “Cienega” spelling is overwhelmingly the most common, everything from hotels, cities, schools, streets, canyons, etc. A cienega or cienaga is a spring that is usually a wet, marshy area at the foot of a mountain, in a canyon, or on the edge of a grassland where groundwater bubbles to the surface. Often, a cienega does not drain into a stream, but evaporates, forming a small playa. The term cienega is used in English in the southwestern United States. The active cienega along Big Cienega Trail and in the lower sections of Windy Gap Trail is evident with lush green vegetation and towering cedars. This map was created by Allan Walter using a GPS, scouting out the trail conditions for the San Gabriel Mountains Trailbuilders during summer 2003. Big Cienega Trail is marked red. The Yellow flag represents the completed trail maintenance as of August 16. The T and S represent the two fallen trees we removed on August 30. The other markings represent particular repair needs on the trail. The trail on the right is the Windy Gap Trail. The one the left is the Islip Ridge Trail. 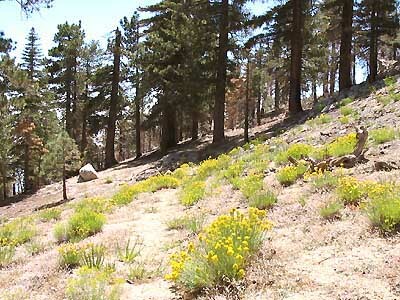 Hundred Peaks Section, Angeles Chapter, Sierra Club "Mt. Islip" - Route 3. Brief driving directions and route description. Some historical background. Simply mentions Big Cienaga Trail. This page was last updated August 17, 2015.